From Thursday, May 16th to Monday, May 20th, Barkerville Historic Town kicked off its 2013 season with five days of frugal fun and festivity culminating in a visit from a Victorian “Queen,” Royal Tea at the Wake Up Jake, and a record number of visitors through the front gate. Barkerville’s annual Victoria Day Royal Tea, which takes place every Victoria Day at the historic Wake Up Jake Restaurant and Coffee Saloon, attracts families from all over the province and offers a unique brand of interpretive programming that can only be found in Barkerville once every year. An authentically-styled Queen Victoria, accompanied by Her “Royal Entourage” offer private audiences to delighted guests at two separate afternoon “high tea” sittings. A combination of hilarity and poignancy ensues, as interesting and oft-times unknown facts about Her Royal Majesty come to light amidst the finger sandwiches, English scones, petit-fours and perfectly steeped Orange Pekoe leaves. 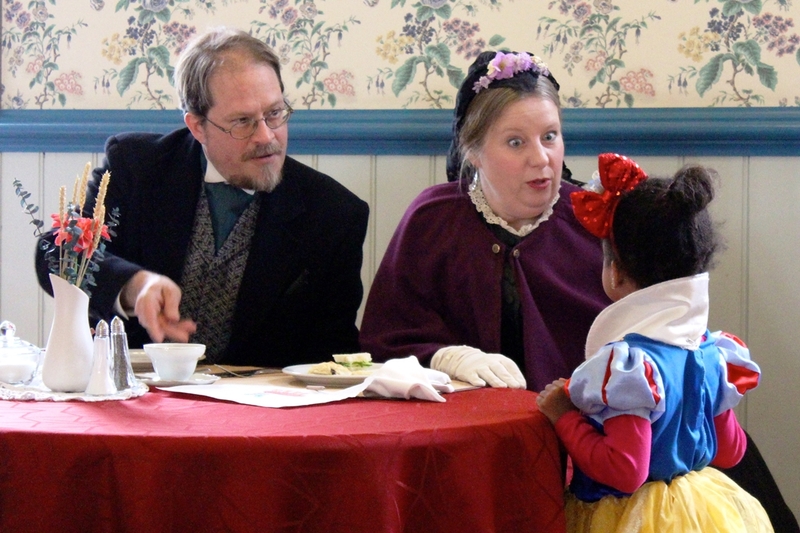 “Our Victoria Day Royal Tea is a great way to get kids and their families interested in 19th-century history,” said James Douglas, Barkerville’s Manager of Visitor Experiences. “There is something particularly enthralling about meeting our ‘Queen,’ and learning a little about Victorian Royal protocol despite the event’s fairly relaxed environment,” he added. Although Queen Victoria never actually visited the Cariboo Goldfields during Her reign (She didn’t even step foot in the Dominion of Canada itself) a record number of visitors to Barkerville were on-hand in the week leading up to Her historically-interpreted visit this past Monday. For more information about the Victoria Day Royal Tea or other special events at Barkerville, visit http://www.barkerville.ca/specialevents.htm.